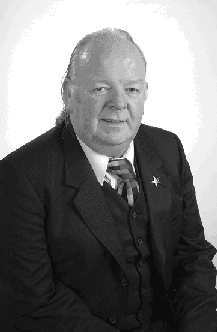 The Scottish Socialist Party's candidate for this constituency is retired insurance salesman Frank Ward, who lives in Dornoch. A lifelong socialist, married with two teenage children, he has lived and worked in the Highlands for 23 years. Since the age of 17 he has been involved in organising trade unions, support for striking steelworkers, miners and firefighters, anti-fascist activity, campaigned against the Poll Tax, and more recently in community activity, and as a welfare rights adviser. His pastimes are chess, cookery and soul music. He was elected unanimously at meetings of SSP members held in Sutherland and Caithness. "I hope to improve on my Party's support at the 2001 election, when the SSP received just over 5000 votes in the Highlands. In particular I will be appealing for voters to cast their second vote for the SSP List candidates, as we have a realistic chance of electing a socialist MSP from the Highlands for the first time." "I will be pressing hard for the abolition of the odious Council Tax, to be replaced by a progressive Scottish Service Tax based not on property but on ability to pay. This will benefit 77% of Scottish households, 7% will pay about the same, and the top 16% will be made to pay their fair share at last". "And if Ireland can manage happily without direct Water Charges, why can't Scotland? We seek to scrap domestic Water Charges completely. "The Highlands SSP is developing a comprehensive Rural Manifesto that will directly address the problems of economic stagnation, low pay, struggling small businesses, job insecurity and Land Reform. This should be ready before May 1st and I can supply all those interested with a copy on request. "Our other priorities in the Scottish Parliament will be: To provide nutritious, free school meals for every state school pupil in Scotland. To introduce a £7.32 minimum wage for all Scottish public sector workers. To create 24,000 jobs by introducing a 35 hour maximum working week across the public sector. To end PFI and clear the private profiteers out of Scotland's public services. Our National Manifesto contains a further 200 actions, large and small, that can be quickly implemented to transform the lives of Scottish citizens. "I will be campaigning against the coming war on Iraq, where thousands of innocent Iraqis are to die for Western control of the oil wells. The Liberals and the SNP only half-heartedly oppose the war until the UN says its OK, but the SSP believes that the war is clearly a cynical and murderous attempt to gain control of world oil distribution, and ultimately for US corporate world dominance". "Saddam is only one of a number of despots created and supported by the foreign policies of the West. Until these policies change, they will be the biggest recruiting sergeants for terrorism." All our policies have been costed and are affordable. A strong vote for the SSP in May - particularly for the SSP List - will help force the Establishment Parties to face these issues. But the SSP is not just seeking electoral support. Regardless of the outcome of the election, we will continue to engage in campaigns on issues that affect ordinary people. We have physically resisted Sheriffs Officers and stopped Warrant Sales, and will fight the same barbaric practices if performed under New Labour's replacement legislation. We will help blockade nuclear weapons sites in protest, support striking workers, and take direct action against GM crops as we did at Munlochy. "All of our major manifesto policies can be implemented by a Scottish Parliament even under the current subservient relationship with Westminster. We campaign for an Independent Socialist Scotland, but we won't wait for Independence to press our objectives". I should like, through your columns, to thank those readers who voted for the Scottish Socialist Party in last week's elections. We came close, our vote jumping up from 5000 to 9000 in the region, but fell about 1000 votes short of getting an MSP elected. In this constituency - Caithnes, Sutherland and Easter Ross - our vote increased by 49.5%. Not bad for a party only four years old ! We have a long way to go yet, but we're on our way. With six SSP MSP's, the campaign nationally was a great success. We now look forward to working constructively with the Greens and progressive independents in the new Scottish Parliament. We will also continue to campaign outside Parliament against attacks on working people, whether being perpetrated by a Labour government or by employers. Caithness, Sutherland and Easter Ross. The Scottish Socialist Party has been redoubling its efforts in the last few days before polling on Thursday. A Highlands & Islands Regional List seat is within the SSP's sights. Opinion Polls published in THREE National Newspapers on Sunday and Monday all put the SSP on course to win perhaps 6 or 7 List seats in the new parliament, and for Tommy Sheridan to perhaps win outright in Pollock. Steve Arnott, the SSP's top Highlands List candidate, is encouraged by the polls. He said: "The trickle of disillusioned Labour voters coming over to the SSP has become a stream. People are seeing the benefits of our common-sense anti-poverty measures like scrapping the Council Tax and introducing free, nutritious school meals for all children." "If we can win a List seat in the Highlands it would mean a massive shift, and really put pressure on the Establishment Parties to seriously address the problems of low pay, disappearing Health services, student debt, job insecurity, and penury for pensioners." "A group of socialist MSPs in the Scottish Parliament could transform it." "Win or lose, after the Election we will be campaigning vigorously on a number of fronts. We anticipate renewed attacks from the Government on public services, under the cynical guise of 'Reform', and we will be standing four- square with the workers affected." The SSP are organising a mass rambl;e across the estates owned by Mahomed al Fayed. The SSP claim that he and other landowners - 72 0f whom own half the Highlands are conspiring to stop the Right To Roam. the ramble will take place on Sunday 27 April at 12 noon assembling at Ken's Garage, Kildary. The Ramble will be a peaceful walk over some of the 65,000 acres owned by Mr Fayed. Everyone is invited to join the ramble designed to leave only footprints and cause no damage. Walk expected to last 90 minutes. Press have been invited. The Scottish Socialist Party's candidate for the constituency of Caithness, Sutherland and Easter Ross is Frank Ward, who lives in Dornoch. "Our 16-page Manifesto for the Highlands & Islands is now available. I hope the voters of this constituency will show their support for the main SSP policies: Scrapping the council tax in favour of a fairer income-based tax, providing free nutritious school meals, ending the PPP/PFI rip-offs, and restoration of our public health system. We believe that rural economic recovery can best be led by public sector investment. We also seek to release more funds for school transport under the arbitrary 3-mile limit, and a wholesale reform of the pathetic public transport system. Public housing requires expansion, and we will quickly build good quality, affordable, council housing. A strong vote for the SSP in May - particularly for the SSP List - will help force the Establishment Parties to face these issues. I also believe that the grants currently thrown at fly-by-night 'inward investment' by RACE, HIE etc could be better directed towards local firms that can show a long-term contribution to the community. "All of our major manifesto policies can be implemented by a Scottish Parliament even under the current relationship with Westminster. We support an Independent Scotland, but we won't wait for Independence to press our objectives". The Scottish Socialist Party has said it will organise, support and participate in acts of mass civil disobedience when the UK government participates in war on Iraq. Highlands & Islands SSP List candidate in May, Steve Arnott, said: "New Labour has demonstrated its contempt for public opinion and international standards of behaviour. Thousands of Iraqis will pay Blair's 'blood price'. Over £5 billion will be spent destroying a people that has no control over its dictatorship nor poses any significant threat to its neighbours, the UK or the USA. Remember that the next time Gordon Brown says there's no money for firefighters or other public services". Frank Ward, the SSP candidate for Caithness, Sutherland & Easter Ross, added: "This is clearly a war of naked greed and aggression, badly dressed up as a moral crusade. Those people remaining in the Labour party are doing so out of misplaced loyalty or simply to further their electoral career. Some dream that the Labour party can be saved from the Blairites, but if you want to push a wheelbarrow you won't do so by sitting inside it. "We will be seeking to attract more disgusted Labour voters to join the SSP and vote for us in the second or List vote in May." Mr Arnott would not reveal what acts are planned, other than to apologise in advance for any public discomfort that might arise. "Physical resistance to overbearing leaders has been a noble and effective weapon throughout the ages. Tony Blair has left millions of anti-war citizens with no choice. We can't just sit and wait till May's elections. I appeal to all people of conscience to support us. I also ask everyone to support a mass protest in Inverness at noon on the Saturday following the start of the war, called by the Highlands Coalition for Justice Not War". So that's why they call it Bush House"
The Scottish Socialist Party is concerned that the popular resentment against the drive to war is being smothered by the mass media. Frank Ward, the SSP's candidate for Caithness, Sutherland & Easter Ross in May, says "I'm used to seeing anti-establishment views being suppressed, but the last few weeks have seen the situation worsen. With one or two honourable exceptions, many views expressed to the media are edited and emasculated to appear as rants". "WHAT IS going on at BBC headquarters, Bush House? Two World Service journalists were sacked last week. Adli Hawwari is a Palestinian. Abdul-Hadi Jiad is an Iraqi." John Fray, the deputy general secretary of the journalists' union the NUJ, accused the BBC bosses of "the ultimate betrayal of free speech". He said, "The BBC has laid itself open to accusations of the World Service being lackeys of the government. "Is it a coincidence that two Arabic service journalists are sacked when a war over Iraq is on the horizon?" The government pays for the World Service with a grant given by the Foreign Office. BBC bosses have also instructed staff to censor the anti-war movement. BBC news boss Richard Sambrook sent an e-mail telling staff to keep anti-war "extremists" off the airwaves, however representative their views are. Journalist Paul Foot said, "It helps to explain why BBC news presenters-the Gavin Eslers and Mark Urbans-vigorously defend the warmongers." Longstanding guidelines banning BBC journalists from attending demos are now being enforced. The absurdity of the BBC's pro-war stance was revealed when 1950s comedy play, The Mouse that Roared, was banned from Radio 4. The play is about a small country in the Alps declaring war on the US. BBC managers feared it could be interpreted as anti-American. Organisers of the million-plus demo in London were refused a seat on Question Time, Newsnight and current affairs programmes. The censorship at the top extends down to the local services. Locally, the SSP reports that hardly any of its Press Releases, on any subject, are being mentioned, either by the local press or by the BBC and commercial radio. In the Weeklies, Letters to the Editor are being published in about 1 out of 6 submissions, three times the usual rejection rate. Journalists should swim out from under the sea of cynicism and hypocrisy they usually live in. Note: Bush House is one of the BBC Headquarter buildings in London and home of The World Service broadcasting in many languages on various wavelengths and on the Internet. There will be a PUBLIC MEETING in the St Clair Hotel, THURSO, at 7.30pm on WEDNESDAY 12th MARCH. Speaker will be Frank Ward, the SSP Candidate for Caithness, Sutherland & Easter Ross in May's elections. Followed by an open discussion. 15 March 1.00pm The Highlands Branch of The Scottish Coalition for Justice Not War is organising what could be one of the biggest protest marches ever seen in the north. The Inverness protest against the War will assemble at 1pm outside Marks & Spencers for a march to Bught Park. There will be speakers & Music. Transport to/from Caithness is being organised by Frank Ward the SSP candidate for the Scottish Parliamentary election in May. Frank Ward can be contacted regarding transport on 01862 811233. Caithness, Sutherland and Easter Ross candidate Frank Ward, who will contest pro-war Liberal Democrat Jamie Stone in May's election, said that his branch of the SSP is organising transport and publicity for a good attendance at an anti-war protest set for March 15th in Inverness. He says: "The government's propaganda machine cannot hide its true motives. Intelligent people understand that this is a war for control of oil supplies and Blair is holding onto Bush's coat-tails in order to pick up the scraps. Thousands more innocent Iraqis will pay his 'blood price'. In my eyes Blair is a sanctimonious murderer". Today (Wednesday) Scottish Socialist MSP Tommy Sheridan spoke at an anti-war rally at Stirling University. 250 students attended and 48 joined the SSP. At St Andrew's University on Monday 150 people attended and 50 expressed an interest in joining the SSP. In Cupar, Fife, on the same evening 100 people attended and 25 joined the SSP. Tommy Sheridan said, "The SSP is at the cutting edge of the anti-war movement and we are reaping the benefits. In the last month, over 500 new members have joined the SSP and I predict that more than that number will have left the Labour Party. Today Labour members are in rebellion at Westminster and they are divided at Holyrood. Labour Party members are voting with their feet in Scotland and on May 1st they will vote with their crosses to punish New Labour. I shall be speaking at a school and students' strike in Glasgow on Friday lunchtime and I predict that many will respond."